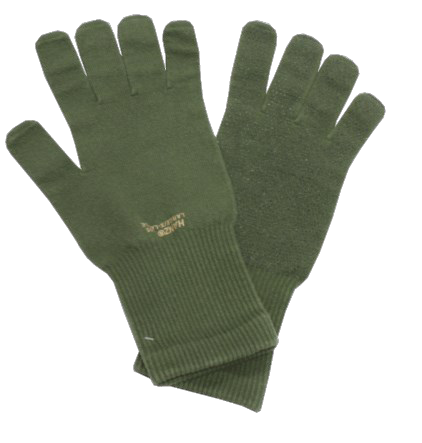 The Light Duty Glove Insert is a product improvement replacing the Improved Glove Insert. The intent is to eliminate the melt/drip hazard, which could occur with the old polyester/lycra insert, by changing to a cotton/lycra insert. The glove insert is a four finger and thumb design designed to be worn either alone or under a glove shell. It is made from a water repellent treated knitted cotton/lycra blend with grip dots covering the fingers and palm. Danalco Inc.'s Seamless Cotton and Lycra Liner glove, Product Numbers 2101 and 2105, has been found to meet the requirements listed in this purchase description.